Habit: Annual, +- glabrous, except fruit. Stem: winged. Leaf: stipules narrow; leaflets 2, 3--6 cm, narrowly elliptic to lance-oblong; tendril branched, coiled. Inflorescence: 1--2-flowered; axis not extended beyond flowers. Flower: calyx tube +- = lobes; corolla 9--14 mm, pink to blue-purple or 2-colored. Fruit: hairs with bulbous base. Chromosomes: 2n=14. Ecology: Uncommon. Disturbed places, wet meadows, creekbeds; Elevation: < 1000 m. Bioregional Distribution: CA-FP (sporadic); Distribution Outside California: to southeastern United States; native to Eurasia. Flowering Time: May--Aug Note: Cult. 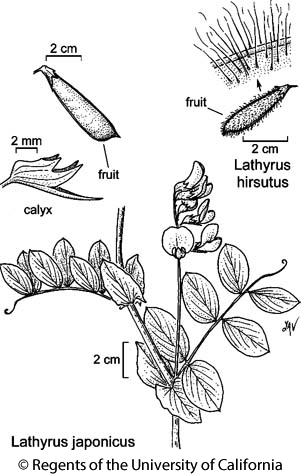 Citation for this treatment: Kelly Steele & Duane Isely 2012, Lathyrus hirsutus, in Jepson Flora Project (eds.) Jepson eFlora, http://ucjeps.berkeley.edu/eflora/eflora_display.php?tid=30303, accessed on April 22, 2019. CA-FP (sporadic); Markers link to CCH specimen records. Yellow markers indicate records that may provide evidence for eFlora range revision or may have georeferencing or identification issues. Purple markers indicate specimens collected from a garden, greenhouse, or other non-wild location.